Under this method, exporter pays the excise duty and clears the goods on his own, without examination by the Central Excise Officer. 1. 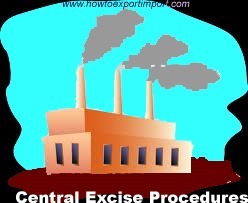 Application to Excise Authorities: The exporters are allowed to remove the goods for export, on their own, without getting the goods examined by the Central Excise officers. The application form –ARE-1 in such cases would be prepared in sixtuplicate, giving all particulars and declarations, after removal of goods. The exporter shall submit triplicate, quadruplicate, and sixtuplicate copies of ARE-1 to the Superintendent of Central Excise having jurisdiction over the factory or the warehouse, within twenty four hours of the removal of the consignment. He would retain the original and duplicate copies for presenting along with the consignment to the Customs Officer at the point of export. 2. Examination by the Central Excise: The jurisdiction Superintendent of Central Excise shall examine the information contained in ARE-1 and verify the facts of payment of duty and other certificates/ declarations made by the exporter. After he is satisfied that the information contained in the ARE-1 is true, he will sign at appropriate places in the four copies of ARE-1 as under. (i) Triplicate : to the rebate sanctioning authority viz. Maritime Collector of Central Excise or the Assistant Commissioner of the Central Excise as declared by the exporter on the ARE-1. This copy, on the request of exporter, may be sealed and handed over to the exporter / his authorized agent for presenting to the rebate sanctioning authority. (ii) Quadruplicate : To the Chief Accounts Officer in the Commissionerate Headquarters. (iii) Quintuplicate: Office copy to be retained by the Central Excise Officer. (iv) Sixtuplicate: To be given to the exporter. The procedure under this rule is similar to the one under claim for rebate. This is governed under Rule 13. Under this rule, there is no PLA(personal Ledger Account) as no duty is paid. Instead of payment of duty, the manufacturer exporter executes bond/letter of undertaking to the amount equivalent to the excise duty. Bond can be executed with surety or without surety. Such a bond is to be supported by the bank guarantee to protect financial interests of excise department. Exporters of the following categories are allowed to execute bond with surety and do not have to furnish any bank guarantee or cash security. Manufacturers registered with Central Excise Department. Manufacturer-Exporter is neither needed to pay excise duty nor file the excise Bond. Manufacturer-Exporter can obtain clearance of export shipment by producing Letter of Undertaking. This is a great concession to the manufacturer who directly exports the goods. govind.ch: On 16 September 2014 Dear sir! By mistake we have paid excise duty, by cash, after shipment of export which took place on 09.06.14 . We have no balance in cenvat credit as of that date.Can we eligible to apply refund as we have paid this challan on 05.07.2014? Hapani darshan m: On 12 January 2015 How many copy of form-1 is required to be submited in claiming of rebate! Padraig Henry : On 12 February 2015 I have read your import/export articles and have a difficulty. We are a supply chain company , putting together a global program for a major manufacturer of ip headset equipment.We have some questions not simply in Indian import, but also around global duty payment and VAT payment.Is this an area you can help with , in some way?Really appreciate your help. Admin: On 12 February 2015 Hi Padraig Henry, Yes, you are right. There are confusions worldwide about VAT. However, WTO is under process of solving this issue by implementing Trade Facilitation Agreement TFA soon expected by 2017. Hope, this hurdle will be resolved. Mohan Shitole : On 14 February 2015 Our Customer from Germany gave us the order of motor vehicle parts and for the production, he gave us the order of Tool Developement on his behalf for production purpose. We developed Tool and raised the Proforma Invoice and against which he made us the payment for Tool Development cost. We used the Tool at our factory for further production we received all against tool payment. After some production the Customer from Germany wants his Tool back. But he need this Tool at his sister unit (another unit of his Group company) in India. What document we should raise on his unit at India and send the Tool ? Returnable Challan for Tool? or Central Excise Invoice? Duty Payment ? or What ? Shailen: On 19 February 2015 We are having two material for export - One is manufactured by us and another is manufactured by our toller. Toller has manufactured the material and transferred the same to our manufacturing plant for export. Now both material are going for export. My question is how i get the excise benifit against my duty paid goods (transferred from our toller). Shall I file two ARE-1 - one is under bond (without payment of duty) and another is under rebate? We are going to export both the material in same container with self sealing. Please suggest. thanks. Ranveer singh: On 16 June 2015 Kya land/flat purchase me pH candidate ko koi rebate di jati h.related om ki parti ko update kre,plz. Satya: On 16 September 2015 Dear Sir, Will you pl clarify the below; If date of ARE1 is 01-01-2015, after succesful export, when we are able to file Rebate/Refund claim with the dept. Is it after 6 months (dept saying). satish: On 31 October 2015 Pl tell me sir for sez disaptch intimate to Rang office and are 1 copy want to submit within 24hrs in case sez sale. manish kumar : On 10 August 2016 I am looking for an export business of prequenza herbal liqids in america. It is a raw herbal liquid used to produce vaccines for the active immunisation of horses from six months of age against equine influenza to reduce clinical signs and virus excretion after infection, and for inactivated vaccines for the immunization of horses against equine influenza (both European and American type of New market equine A/2 influenza virus). sir i would like to know the various rules and process regarding. Agnibha Dutta: On 11 August 2016 I am doing an internship on Working Capital Management. I am a student of MBA (Finance). I came across an article in your website titled as: Function of Cenvat. The article was extremely helpful to me and gave me immense knowledge as to how to understand the intricate management of working capital. I request your kind self to please allow me to use the material of the article for the successful completion of my project report. Due citations and bibliographic references would e given to the author and/or the website and/or the institute. The report will be used for internal purpose only and won't be redistributed publicly. angad singh : On 12 August 2016 I reside in Faridabad. I have a shop of gold ornaments and we also make the ornaments in house. I am interested in exporting gold ornaments to Dubai and importing back raw gold for the same. I would like to know all the details involved for the same like excise and duties. We would like to know that in what all you can help us for the same. Nihal Shrestha: On 07 December 2016 Whose responsibility is it to submit the ARE-1 to the exporter after custom clearance. Is it the responsibility of the importer or the exporter has to get it from custom office? In case the ARE-1 copy is not received by the exporter is it the liability of the importer to pay exempt excise duty along with interest and penalty?